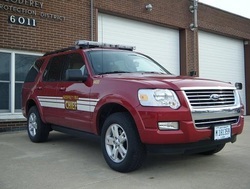 Unit 1400 is a 2009 Ford Explorer and carries a variety of equipment to assist the Fire Chief in incident management and fire investigation. Located at Station 1, rescue 1450 is a 2009 Ford F-150 that is used for EMS response. It is equipped with basic/advanced life support medical equipment and basic tools. 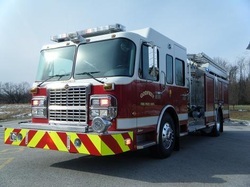 Located at Station 1, rescue engine 1412 is a 2009 Spartan/Toyne featuring a 1500 GPM Hale pump, 820 gallon water tank, 50 gallons of class A foam and 1500 feet of 5" hose. This unit is also equipped with a thermal imaging camera, positive pressure fan, basic/advanced life support medical equipment. 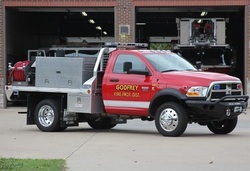 1412 is also equipped for vehicle accidents and carries a variety of extrication and stabilization equipment. Engine 1412 is recognized by the Madison County Hazmat Team as a "hazmat engine" equipped for first-in response to hazardous materials incidents. 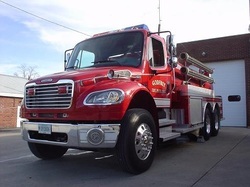 Located at Station 1, tender 1460 is a 2005 Midwest Fire Custom Tanker featuring a 250 GPM Darley pump, 2500 gallon water tank, and a 3000 gallon dump tank. This tanker responds to areas of the district that do not have hydrants and has responded to several mutual aid requests by neighboring fire departments. 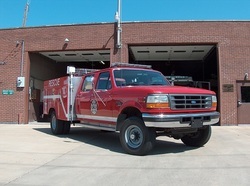 Located at Station 2, rescue 1452 is a 1996 Ford F-350 that is used for EMS response. It is equipped with basic/advanced life support medical equipment, and a variety of other equipment for special situations. 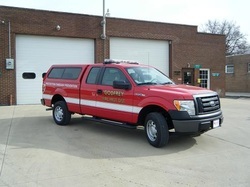 Located at Station 1, unit 1471 is a 2011 Dodge Ram 4500 with a Hale HPX200 pump, 300 gallon water tank, and a variety of tools and equipment for use on brush fires. Located at Station 2, unit 1422 is a 1998 KME Custom Rescue Pumper featuring a 1500 GPM Hale pump, 940 gallon water tank, 30 gallons of class A and B foam, 1500 feet of 5" hose, and a Scott thermal imaging camera. For motor vehicle accidents, 1422 carries a full compliment of Res-q-tec extrication tools, lifting bags, and stabilization struts. It is also equipped with basic/advanced life support medical equipment. Located at Station 2, brush 1472 is a 2012 Dodge Ram 4500 with a Hale HPX200 pump, 300 gallon water tank, and a variety of tools and equipment for use on brush fires. Located at Station 2, reserve engine 1410 is a 1998 KME featuring a 1500 GPM Hale pump, 940 gallon water tank, 30 gallons of class A and B foam and 1500 feet of 5" hose. 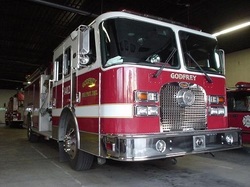 1410 serves as a front line pumper when 1412 or 1422 are unavailable. Reserve engine 1420 is a 1986 Ford C8000/E-One featuring a 1250 GPM Hale pump, 1000 gallon water tank, and a 3kW diesel generator. 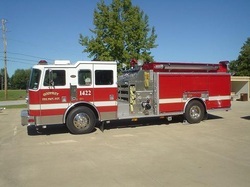 1420 is available as a back up pumper and is used for training. The district also has a portable air cascade system to replenish breathing air bottles at large incidents. 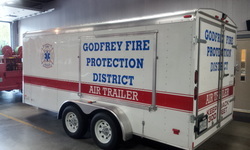 The trailer was obtained through a federal grant and is available for response throughout the St. Louis Metropolitan Area. It was also equipped with an impressive cache of rope and confined space rescue equipment.